This video shows magnetic conveyors designed to move and transfer a variety of hand tools through a buffing process. The conveyors were designed to ensure that each side of the hand tools went through the process to lightly clean the laser marks on both sides of the tools. The buffering wheels were added at the customer site, allowing us to show the movement of the hand tools in this video. Hand tools are placed on the first magnetic conveyor between the centering guides. The magnetic bedplate holds the tool in place while the customer’s buffing wheel buffed one side of the tool. The tool would then be transferred to the second magnetic conveyor, which is upside down to allow for the buffing of the opposite side of the tool. At the end of the second conveyor the tool would drop on a UHMW plastic lined chute where the bottom, non-magnetic conveyor would then return the tool to the operator. 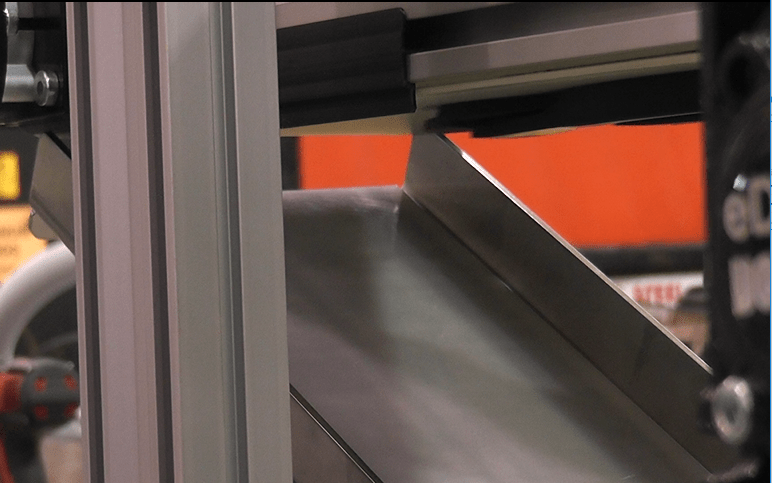 Magnetic conveyor options are available on a variety of Dorner conveyors. Please contact Dorner to see how magnetics can help your process.